Chapter XII. 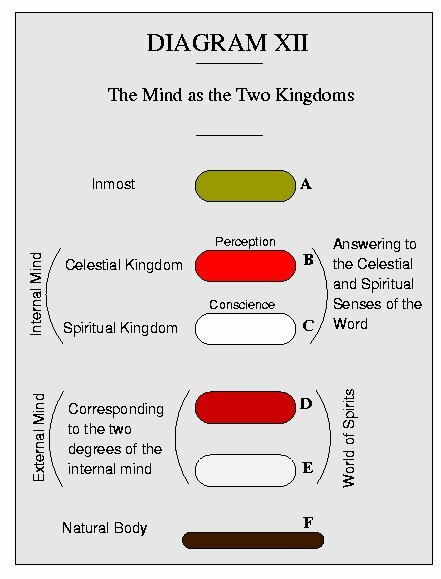 The Mind as the Two Kingdoms. THE whole spiritual or internal mind is here presented in two degrees, the celestial and the spiritual. When by regeneration these two degrees are opened in man and stored with good and truth from the LORD, they answer to the two kingdoms, celestial and spiritual, into which the whole heaven is divided. When the degrees of the spiritual mind are so opened and stored, then also the two degrees of the natural mind are cleansed of evil and falsity and replenished with good and truth of a lower degree, and form an orderly and correspondent base for the two kingdoms of the internal mind. Every regenerate man is in one kingdom or the other according to his state of regeneration. In the internal mind reside love to the LORD and love to the neighbor, and these heavenly loves ought to rule and qualify the loves of self and of the world located in the external mind. With the regenerate they do rule and impart a good and true quality to these natural loves. But if the natural loves rebel and throw off the dominion of the higher, as with the wicked, they become evil, pervert the external mind, and close up the internal. This state of the external is called hell. In Last Judgment 14, the lowest hell (in the degree E and called the hell of devils), is said to be behind, because that which is lowest in the order from above down, and outmost from within out, is behind in the order from front back. The satans mentioned in Apocalypse Revealed 97, 550 and 841 are in the degree D, the devils in E.
The meaning in this passage is not that the spirituals have not will but that their will of good is formed by truth and is therefore intellectual. Inversely among the satans evil is the evil of falsity and is therefore intellectual, and inheres in the love of the world as a final end. Evil arising primarily in the will is voluntary and is the evil inhering in love of self as a final end; this is the ruling love among the devils. This diagram illustrates True Christian Religion TCR 234, 235 and 236 and like passages throughout the Writings in which the angels are considered in two kingdoms and men in the natural degree below. The celestial angels are in B, the spiritual in C. In B is the celestial sense of the Word; the spiritual sense in C. The natural sense is in D, E, F, which together constitute the natural kingdom mentioned in 236. The higher celestial part of the natural sense is in D and the higher spiritual part in E; the merely literal sense, including the lowest spiritual and celestial element, is in F and answers to the life of the natural body. The celestial degree and kingdom of the internal mind, is the primal abode of celestial perception, the spiritual degree that of conscience. Perception and conscience flow thence into the natural mind, gifting it with natural perception which is celestial, and natural conscience which is spiritual.